India origin scientist develops a computer that can run on water droplets. Researchers have developed the world's first synchronous computer that operates on water droplets. 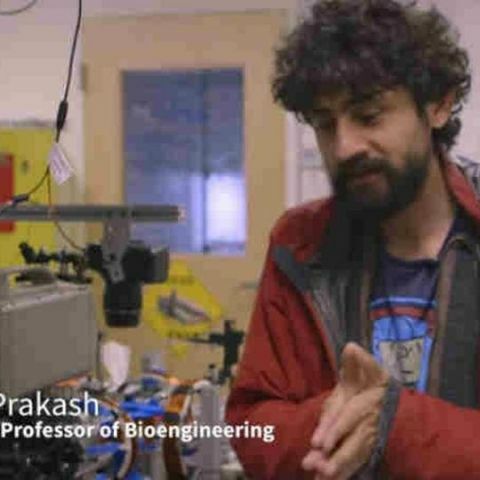 The computer has been developed by Manu Prakash, assistant professor of bioengineering in Stanford University. His team has built a unique computer that operates using the unique physics of moving water droplets. The work uses Prakash's expertise in manipulating droplet fluid dynamics with a fundamental element of computer science - an operating clock. Prakash along with his graduate student assistants Jim Cybulski and Georgios Katsikis, have built a computer clock, a system at the heart of every computer that keeps operations moving in sync using tiny water droplets that could be moved and manipulated while trapped in a magnetic field. Each time the magnetic field flips, the bars polarity changes and each water drop moves through the maze one spot at a time, with binary 1s and 0s indicating either the presence or absence of a drop in each spot with every flip. Prakash said, "In this work, we finally demonstrate a synchronous, universal droplet logic and control." Because of its universal nature, the droplet computer can theoretically perform any operation that a conventional electronic computer can do, although at significantly slower rates. "Following these rules, we've demonstrated that we can make all the universal logic gates used in electronics, simply by changing the layout of the bars on the chip," Katsikis said in the report. "The actual design space in our platform is incredibly rich. Give us any Boolean logic circuit in the world, and we can build it with these little magnetic droplets moving around." Prakash and his colleagues state that the ability to precisely control droplets using fluidic computation could have a number of applications in high-throughput biology and chemistry, and possibly new applications in scalable digital manufacturing. The teams results are published in the current edition of Nature Physics. "We already have digital computers to process information. Our goal is not to compete with electronic computers or to operate word processors on this," Prakash said. "Our goal is to build a completely new class of computers that can precisely control and manipulate physical matter. Imagine if when you run a set of computations that not only information is processed but physical matter is algorithmically manipulated as well. We have just made this possible at the mesoscale."